Microsoft Office 2013 – Yay or Nay? Are you switching to Microsoft Office 2013 or thinking about switching? Here is a brief overview of the best/worst of Office 2013 based solely on my own experience. We do not offer an in-depth view of all that’s new and different, just some of the top features worth noting. This blog is based on the preview version of Office 2013 which means that some of these features may still change before the final version is out. Lightening fast install: When you first click Install, in a flash the applications start before you even finish installing them. Yep, the splash screen informs you that you can start working while it is streaming the rest of the features. What it means: no need to wait, Office 2013 installs in the background while you are already productive! 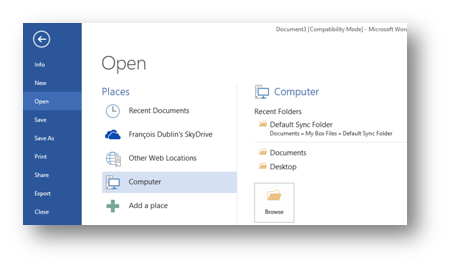 Store Documents in the cloud with SkyDrive: Not entirely new but so much easier to access all your SkyDrive storage from the File Open screen and indeed from the File Save As dialog as well. Also, quite a good amount of storage available for free by default makes this a great place to always have access to essential documents. Excel 2013 Power View Integration: In Excel 2010 PowerPivots were installed as an addin and provided some Business Intelligence to your data – although sometimes setup failed inexplicably and needed a bit of patience. 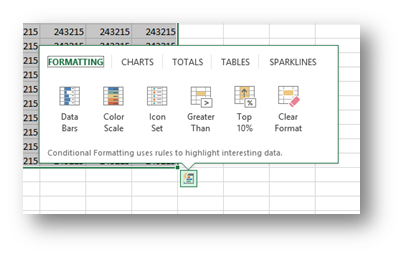 In Excel 2013, PowerPivot features are taken for granted and allow you to powercharge databases/tables with relationships! Business Intelligence heaven! Yay, yay, yay. Note: you will need SilverLight as this screenshot illustrates, which also installs in a flash. Intelligent Contextual Options: If you copy and paste much or like to drag stuff with your mouse, these new pop up buttons offer very smart options indeed, in a very legible manner. No more guessing what the options mean. I won’t even mention Flash Fill in Excel, which is like mind reading! Was Derren Brown involved at any stage? You wonder! Autosave Document Recovery is missing: Not enabled in the Preview version as far as I can tell or not working? Either way, I have lost countless documents and spreadsheets because I am used to relying on that feature. New menus capitalised: How many times do we have to say it? Capital letters are used for SHOUTING online and nobody wants their word processor to shout at them EDIT, VIEW, HOME! Besides, it reduces legibility. Am I fussy? Open Recent Folders: Eeek! Microsoft! I used to, in Office 2010, simply click File and Open and I would see a list of recently used files along with recent folders. In Office 2013 however, recent files and recent folders are in two different screens. Why oh why? One extra click to find my document’s siblings is one click too many! 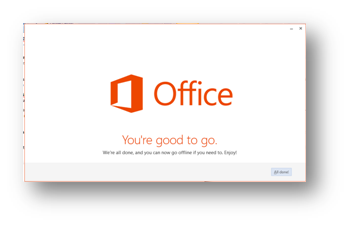 Personally I loved the layout of that screen in Office 2010 and this version makes me very impatient. SkyDrive storage support only: OK, understandably Microsoft Office works with Microsoft storage but still, I wish I could easily work with my Dropbox account and other similar services. Why? Because I use a number of services depending on the nature of my documents: personal, professional and backups. Chart options as a task pane: Nay! Nay! Nay! Once again, I found the tabs in Excel 2007 and 2010 worked very well and were extremely clear. Endless collapsible windows in the taskbar (sidebar? whatever it is called nowadays) mean users are lost again in UI changes. Oh well! Kinda makes sense and gives a better experience: I bet most people didn’t realise that they could leave those properties dialogs open and click around chart features to see options. Even though I knew that, I always tended to click OK and then right-click again for more properties. Okay so maybe this should be under Yay but I don’t like the visual clutter. Every version of Office in particular and software in general brings its own frustrations and innovations to your working day. Overall, Office 2013 offers the right amount of tweaks and simplifies the way we work so we forgive if it does not always get it right which far outweighs the little changes of habits we will have to face with this version of Office 2013. After all, updates are frequent and if they don’t solve the problem we can always look forward to Office 2015? 2016?